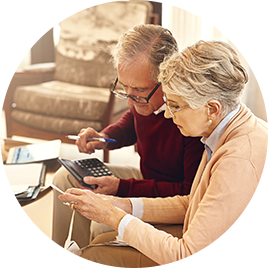 There are some financial decisions to consider when you turn 65 and 71—a financial planner can help remove the guesswork. Do I Have Enough to Retire Now? This is the question most people ask once they reach the typical “retirement age”. Before you start crunching the numbers, take stock of your personal goals. 2,000 hours. That’s how much time the average Canadian spends at work each year. Do you have a plan to fill that time throughout your retirement years? What do you want to achieve during retirement, and what is most important to you, if you can’t do it all? Thanks to advances in medical care and healthier lifestyles, Canadians can spend 30 years or more in retirement. When you talk to your financial planner about how much money you will need, keep these three stages in mind. This is the time when you’re likely to be the most active. It may also be one of the most expensive stages of retirement, as you may be busy fulfilling your retirement vision—whether that’s travel, purchasing a vacation property, going back to school or pursuing leisure activities. Budget for these expenses, but keep in mind there may be many years of retirement after this “vacation” phase. During this stage, the excitement of retirement tends to settle down. You may develop predictable routines and focus on your health, family and comfort. During this stage, spending tends to decrease as activities level off. As you age, you will likely slow down further and limit your activities. During this stage, you may find that you or a loved one is in need of more care and assistance—as such, spending may begin to increase again. Retirement spending isn’t a straight line—or is it entirely predictable. Recognizing the needs you may have during each stage can help you plan out your future and the finances to support it. Your Future by Design is a discovery process that you can walk through online and with your RBC Financial Planner. By asking the right questions, we can help you identify what will be most important to you in retirement. After we understand what your goals are, we look at what you own, what you owe, and where you stand—to design a plan that can be relevant and sustainable throughout your retirement. What Are You Going to Do with Your 2,000 Hours After You Retire? Get your guide to retirement income planning.